Since baseball head coach Greg Frady took over six years ago, going to a game at Panthersville hasn’t been the same. They’ve won 58 percent of their games and nearly seven out of ten games at home. Coach Frady has presided over only two losing seasons since coming to the team. So when he calls this team “special,” it makes you sit up and pay attention. Frady attributes the success to both his players and coaches, saying they are “constantly stressing the right things,” like staying on top of the ball and having a good two-strike approach. Something must be working, because as of April 21, the Georgia State Panthers are second in the nation in batting average, boasting a .326, only fractions behind leader Kansas State. In Chad Prain and Caden Bailey, they have the players with the tenth highest batting average and the 61st, hitting .414 and .381 respectively. Chad Prain, besides leading in team batting average also leads in RBIs, treats every at bat as if its his team depended on it. Prain works on keeping focused, and makes sure that every at bat counts for something. “I approach every at bat with the mindset of ‘what do I need to do help my team in this situation? Sometimes that’s a base hit, sometimes it’s a bunt or a sacrifice fly, sometimes it’s just finding any way I can to get on base, whether it’s a walk or a hit by pitch,” Prain said. Bailey, a sophomore out of Suwanee, Ga., has improved tremendously since his freshman season. His batting average jumped nearly 80 points, while being versatile enough on defense that he can play nearly every infield position. His defense has been invaluable to the Panthers, having improved his fielding rating nearly 30 points from last year. And through improving on both offense and defense, Bailey has found out how to be a leader. “After the experience that I gained as a freshman, I have learned what it takes to play at this level. I have more experience, and I have gotten bigger, stronger and faster. Most importantly, I have tried to become a leader on and off the field,” Bailey said. Though individual success is nice for the player, sometimes it doesn’t translate over to success on the diamond. This, however, is not the case. The Georgia State Panthers are 29- 17, with a sterling home record of 19-5. They have 10 games remaining in the regular season, with seven of those coming at home. And if the Panthers keep on hitting like they do, then the sky, and the NCAA tournament, is the limit. *Chad Prain and Caden Bailey are not the only offensive superstars on the team. Here are three others that have contributed to Georgia State’s soaring offense. 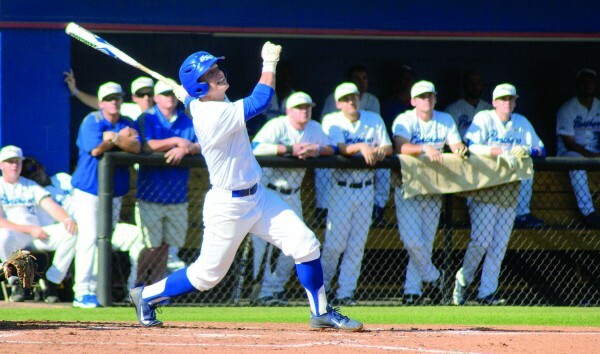 Chase Raffield: A redshirt junior, who transferred into Georgia State after three years at Gordon College, is hitting a robust .361 and is leading the team in home runs (9). Raffield is patient, racking up more walks than strikeouts, and has a team-high .653 slugging percentage. Greg Browder: A senior from Ac- worth, Georgia, is currently hitting .349 with a .448 on base percentage. Browder has been a versatile player for the Panthers, starting in 29 and playing in 35 games as super utility infielder. Josh Merrigan: The freshman from Marietta, Georgia has started 43 games, is batting .347, has 67 hits, and is second on the team in stolen bases with 11. *This story was part of The Signal’s “Readers Issue.” The idea was suggested by Blain Reid, a junior communications major.